Manager Dave Roberts confirmed Kershaw (shoulder) will not start for the Dodgers on Opening Day, Ken Gurnick of MLB.com reports. This comes as no surprise, as Kershaw has been behind other pitchers all spring while battling shoulder issues. 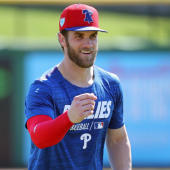 Per Gurnick, the southpaw is slated to face live hitters Wednesday, though it's still unclear when he'll be cleared for game action, leaving his return date murky. The good news is Kershaw will be in Los Angeles during the team's season-opening series, suggesting he could be available to make an abbreviated start during the first week of the season, if all goes as planned. The Dodgers have yet to announce who will start in place of Kershaw on Opening Day.